Black Ops 3 Revelations is easily the biggest zombies map to date and it's jam packed with many smaller Easter Eggs. In this post I'll show you all of the side easter eggs including the many hats, time trial weapons, super purple perks and much more. There appears to be 8 (so far) hats/helmets in Revelations. The Margwa head is really easy to get if you know the exact steps. Simply kill 2 x Margwa's but make sure you use only one bullet per eye to kill each Margwa. A sniper or other high precision weapon is your best choice. A purple Stamin-Up perk icon will appear at the bottom of the screen to signify that you're wearing the head. This is your first Super Perk!! One of the easiest helmets to get. Collect the Summoning Altar parts and complete the necessary steps to build the Keeper Protector. Unleash the keeper by paying the required number of points at one of the summoning points. Let the keeper kill roughly 25 zombies until you hear the audio cue. Now pickup the helmet from the Kino stage area for your Super Jug Perk, increasing your protection from zombies even further. An ancient and truly OP helmet, this knight/templar helmet provides great damage reduction from boss attacks and increase damage against bosses. Note: Panzer kill may have to be inside Apothicon during gas. Notification sound per step is a fog horn. One of the new enemies in Revelations is the Fury. These monkey like creatures, crawl on all fours and have fire coming from their mouths. Killing enough Furies will trigger the Fury Helmet to spawn in, which if worn, offers advantages in Fury confrontations. Easily the most OP helmet in the map, the God helmet (aka Apothicon Mask) gives players an insane amount of extra protection from attacks and an OP 50% damage boost. The gas/mist appears in the acid pool roughly every 3-4 minutes whilst inside the Apothicon. Also grants Super Jug and Super Stamin-Up. Combined with standard Jug, you will have around 10 hits before getting downed!! Both perks are permanent and will not be lost when downed. The wolf head is probably one of the easiest heads to get. Simply go to the Der Eisendrache room, throw a grenade at the skeletons tomb up above (same location where you completed the Wolf Bow quest in Der Eisendrache). Wait for the skull to drop down, then kill zombies in the vicinity during anti-gravity - blue orbs will appear from the zombies to signify you're doing this right. Upon completion, the audio cue will sound. Next head back to the Kino stage once again and pick up the Wolf Head from one of the clothes stands behind the teleporter. This wolf head has only one benefit - sprint duration increased. Not bad if you want to save yourself time and money buying the Stamin-up perk. The viking helmet looks pretty cool but in fact it's bonuses are fairly weak. If you're interested in claiming this helmet go to Der Eisendrache where the Corruption Engine is, look up and spot the clock. Shoot the dials of the clock in this order: 9,3,5. Next, fill the urns by getting zombie headshots in close proximity. 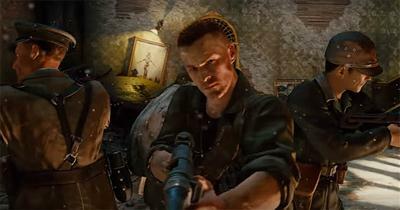 The urns are in Der Eisendrache (hallway leading down to primis statues), Origins (small room in the trenches), Verruckt (upstairs in kitchen by blood covered table) and Kino (projector room). These hats do not provide the same bonuses as those listed above. They appear to be related to a larger (currently) undiscovered Easter egg. Al's hat is located in the Mob of the Dead section of the map. Look for the jail cell with the toilet seat inside. The hat is perched on top of the seat - simply interact to claim this collectible. We all speculated that Takeo's Katana would eventually become a Wonder Weapon in Black Ops 3. Well, the time has come for this legendary weapon to make an appearance! Although not quite a Wonder Weapon, the Katana is awesome none the less. *If you're not sure how far into the Easter Egg you need to go, check up to Step 11 from the Easter Egg guide. Once the bedroom is accessible, take the Wisp (blue glowing orb) from the headlights of the car in Spawn. Go through the teleporter to Samantha's bedroom and interact with the box that has the large question mark on the front (like a mystery box). Return to the outside area and pick up the Katana weapon from the wall at the top of the Shangri-La steps. Enjoy!! The Der Eisendrache section of the map holds a particular secret. Activating the anti-gravity feature (by standing on the pressure plates) not only lets you wall run horizontally but also ascend out of the map completely. Once weightlessness is activated, wall run as normal but ascend upwards until you get high enough to leave the room. Continue following the route outside by double jumping between the broken pieces of wall. Make sure you don't fall down otherwise you'll be teleported back to ground level. Successfully double jumping along several broken walls will lead to a free perk reward at the end. The hardest part is right at the end when you reach the larger pillar - I suggest "curving" around the side of it, giving yourself one final double jump to catch the perk on the way back down (see video guide above). The original Tommy Gun from Mob of the Dead, the M1927 can become a wall gun weapon. There are several chalk/blood markings around the map which spell out a short sentence. Find, interact with, and move each of these wall writings to an alternative place. The easily accessible Nacht der Untoten section has a hidden secret which is particularly useful in a team. Find the empty table shown in the image above, hold square to place your equipped weapon. Another player can now pick up you placed weapon for themselves. This sharing tactic is particularly useful for distributing OP weapons among the team, or passing on a strong weapon to a downed ally to give them a fighting chance of staying alive. The time trial weapons were first introduced back in Gorod Krovi. They allow players to win free weapons in return for completing X number of rounds in a certain time limit. The free weapons are claimed from the top of the temple stairs at Shangri-La. Completing 5 rounds in 5 minutes rewards you with the Nunchucks melee weapon. This weapon provides the player with superior melee attacks, comparable to the bowie knife. 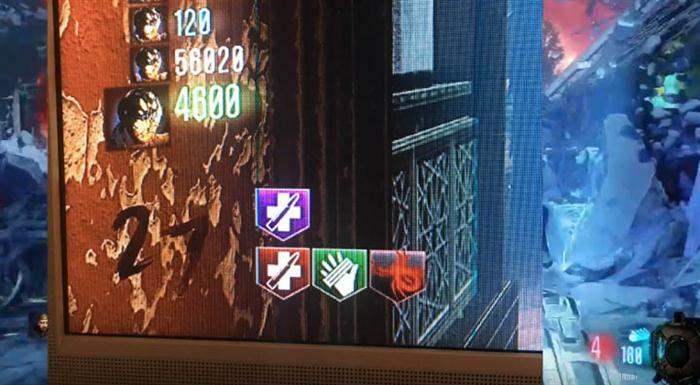 The Round 10 challenge must be completed in 12 minutes. It rewards you with the Skull Splitter melee weapon, essentially a long Mace with a staff like end to it. Completing 15 Rounds in under 19 minutes. Probably the hardest time trial to complete, the Buzz Cut is like an axe with a circular, jagged blade at the top. The Round 20 trial must be completed in 32 minutes. It rewards you with the Nightbreaker melee weapon which is also known as "Bone Glass". It provides an insane amount of melee power and was originally one of the multiplayer weapons added during the summer. What I particularly love about this weapon is it's speed and the cool spinning animation when running.